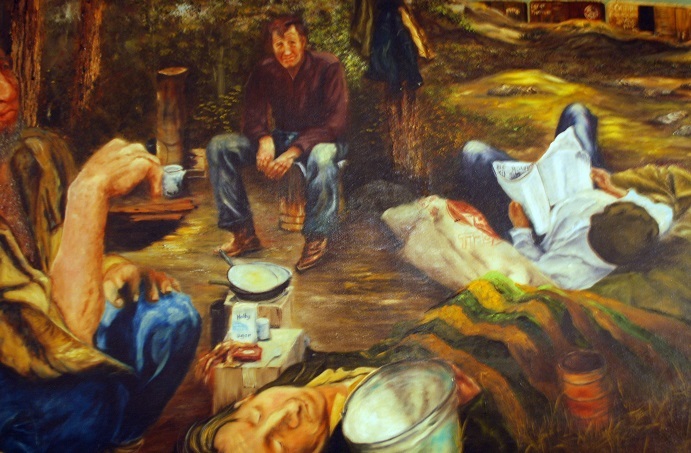 Hobo art from the Hobo Museum in Britt, Iowa. Mais comme un pauvre hobo. Plus personne pour me soigner. Mais comment moi je vas faire ? Mais ça, ça me fait pitié. Like many folk songs, the origins of the Cajun song, Pauvre Hobo are as murky as the waters of the bayou. Songs are passed down from generation to generation, village to village with a line changed here and a line tweaked there. Someone will credit an uncle's brother's cousin as the writer but the song remains tied to its community until it is recorded. Pauvre Hobo has also been credited to the Fiddle King of Cajun Swing himself, Harry Choates, who may have just changed a line here or tweaked a line there. An instrumental version of Pauvre Hobo was recorded for the Smithsonian Institute on their Smithsonian Folkways label in 1978. The recording of the album — Cajun Country Guitar — lends to the mystique of the song. Notes from the Folkways website read, "On a search for recordings from an old Cajun singer, Gérard Dôle encountered guitarist Richard Fontenont on a proverbial dark and stormy night. Fontenont and his family took him in, told him stories, and later, Dôle recorded the material for the album." The following translation is not a literal translation of Pauvre Hobo. As nothing more than a poor hobo. There is no one to take care of me. But how am I gonna do it? But that in itself, that makes me sad. Americana band California Zephyr released their version Of Pauvre Hobo, titled Poor Hobo, with lyrics in French that in keeping with the history of the song differs from the lyrics posted above. The video however inter-cuts scenes of the band playing with scenes from Bill Daniel's hobo documentary "Who is Bozo Texino?" Labels: Bill Daniel, Cajun, California Zephyr, francais, Harry Choates, hobo, Pauvre Hobo, Poor Hobo, Smithsonian Folkways, song, translation, Who is Bozo Texino?